Hello! I am so very excited to be sharing some projects I made with my new Flower Medallion dies that will be available at Papertrey Ink on March 15th! Some of you know that I have been making Polymer clay ornaments for many years, and for the past few years, I've done the Snowflake Medallion ones. Well my new series of dies are inspired by my clay ornaments. You can layer them in so many fun ways, and in so many beautiful color schemes. They work wonderful for any season of the year depending on the colors you use. I can see them as ornaments on the tree made from felt or fun foam, on packages as tags using any kind of materials, and or course on the front of a card done in pretty papers. I have several made up to show you! 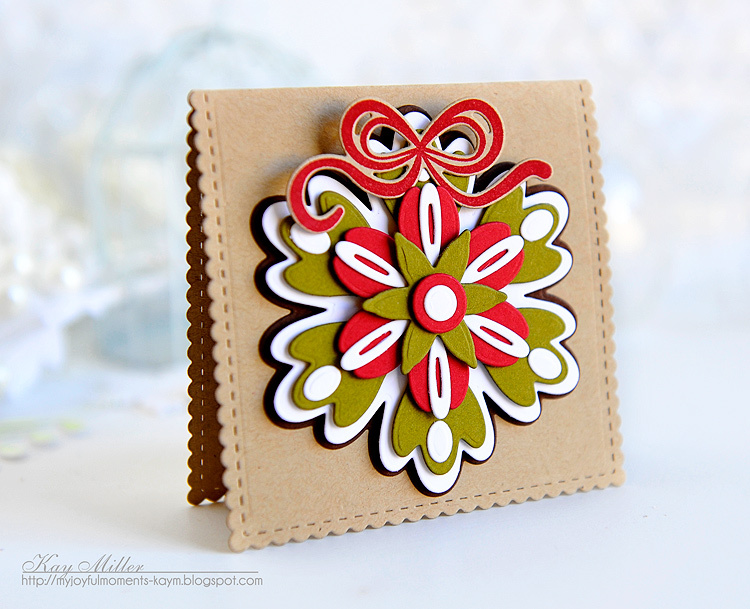 My first project is a card using all of the dies layered to create the medallion. I used Soft Stone, Sweet Blush and white. 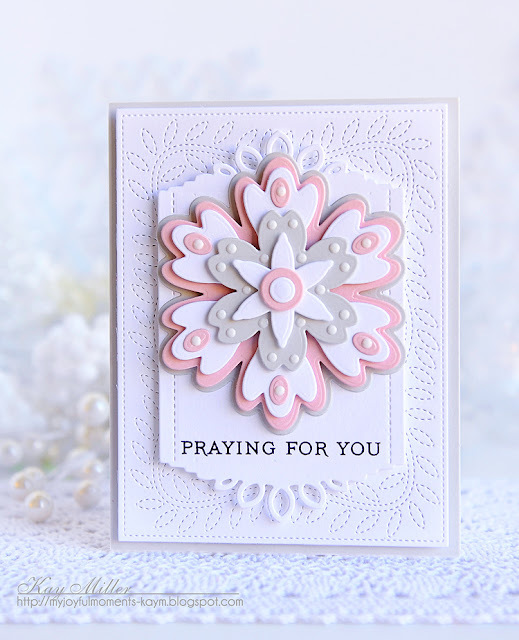 The background is Soft Stone and I layered the Cover Plate: Stitched die cut on top along with the Center Style Feminine die cut, and then the Flower Medallion. 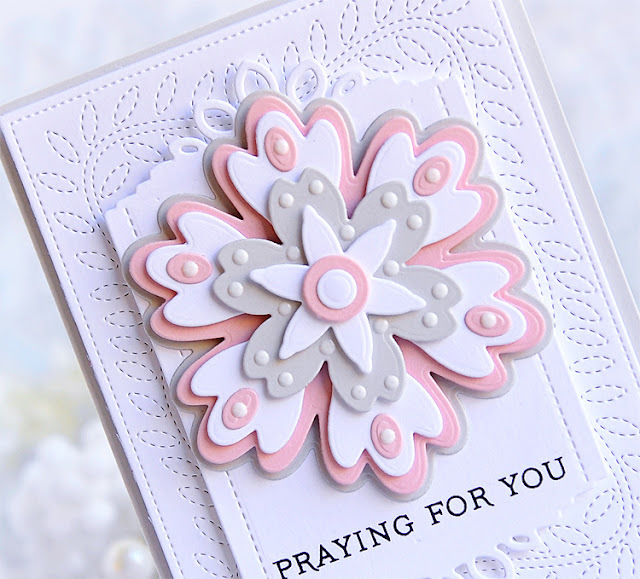 I used foam tape to layer my Flower Medallion because I just love the dimension it gave it, but you can always just glue the layers with adhesive tape or liquid glue to make a flatter card that will go through the mail easier. After layering everything, I added some Gloss White Nuvo Crystal Drops for some little accents to the flower. The sentient is from Botanical Blocks III. I was so excited to find the Medallion Flowers fit perfectly on the little square notecard die included in the Don't Forget To Write Make it Market Kit. I just love this, and can see me cranking these out for gifts at Christmas time! The little bow at the top is from the Tinsel & Tags Make it Market Kit. The Flower Medallions also fit perfectly on the Tag Sale: Quilted die, my favorite tag die ever! On this one I also layered some of the snowflakes from the Freshly Fallen Dies. Any dies that are round and have six sides will layer with the Flower Medallion, so there are endless possibilities for making fun flowers! Again on this one, I layered the petals with foam tape and added some little dots with acrylic paint and Crystal Nuvo Drops. Thanks so much for stopping by! The Flower Medallion Dies will be available at Papertrey Ink on March 15th along with an amazing line up of beautiful products! 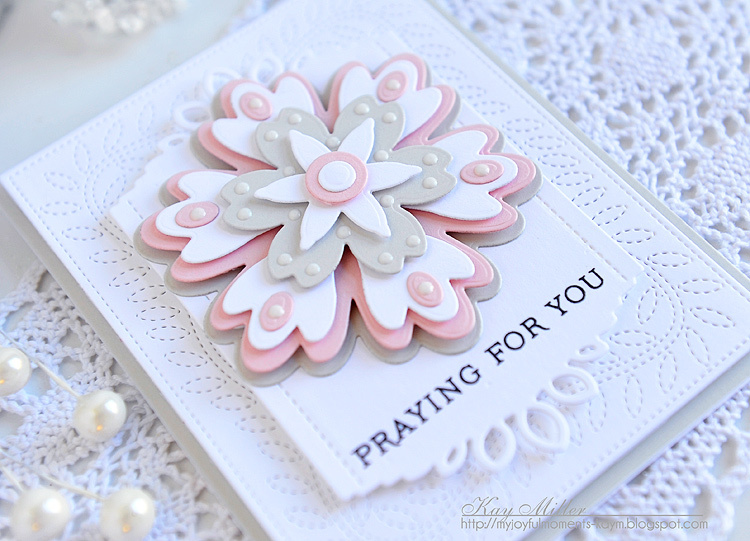 Be sure to check out all of the inspiration from the Design team on Nichole's Blog! Kay, these are amazing! I IMMEDIATELY thought of your ornaments when I saw them. I love all your colorways, too; from soft and sweet to fiery and dynamic! Just super. 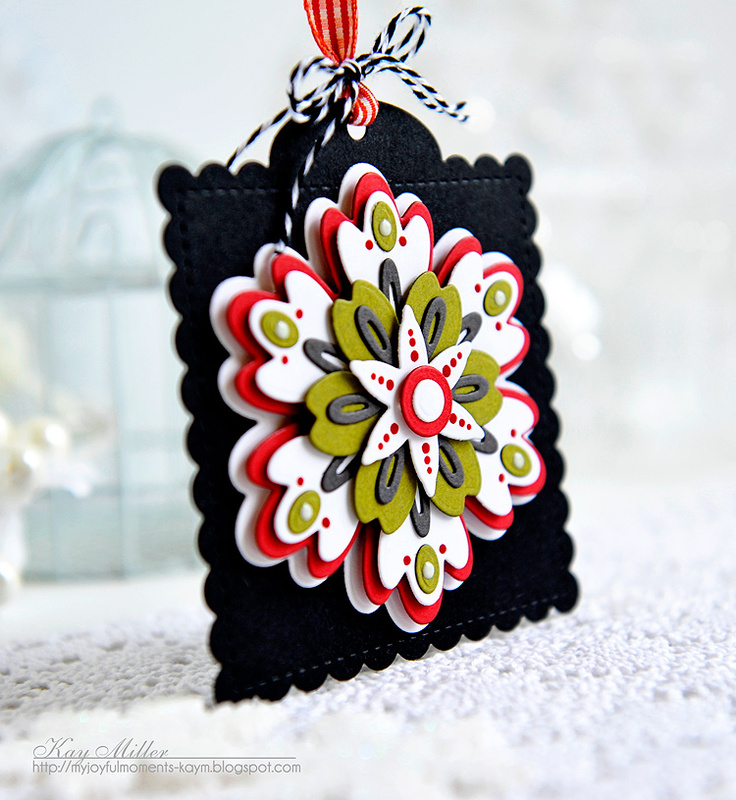 Love the look of your beautiful Flower Medallion! Kay, your work is always gorgeous. These are simply STUNNING. The flower medallion fits perfectly on my favorite tag!! I am so excited for these dies! As you know, I love your Polymer Clay Ornaments so I will love the ones you do for this series!! What a beautiful surprise! This will soon be my favorite medallion die set! Gorgeous use of colors and layouts. Can't wait for release! Way to go, Kay!!! These are beautiful! Love seeing the different color combos and ways to use these intricate medallions. Great job, Kay! I'm so excited to see these dies, Kay! They remind me of your snowflake ornaments that hang on our Christmas tree each year! Even more than the dies, I'm excited by your color combinations today. They're incredible. So excited to see these, Kay!!! Gorgeous!!! Just love this concept, Kay! Your creativity is going to have me making my Christmas gift tags early. Oh Kay, these are stunning, I can truly see the endless possibilities with these dies! Your cards are just amazing! so happy you are still with PTI!! STUNNING!!! That is all I have to say! Oh, and I can't wait to get them in my hands!!! Hi Kay! While playing along with the trivia contest, I discovered your clay ornaments for the first time. What do the girls say when they're overjoyed? ACK! Or something like that. 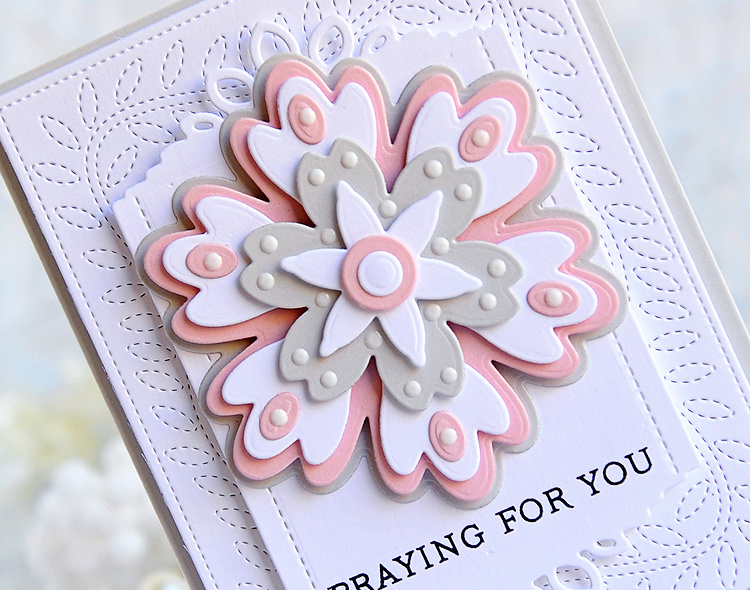 I am beyond thrilled that you're sharing your designs with us! I've already decided to try my hand and they will be on my Christmas tree this year. And maybe my children's too. ACK! All kidding aside, thank you so much Kay. You're not only talented but very generous. Yay! Congratulations for remarkable designs Kay🤗 yay! I treasure the ornaments that are handmade by you! This is So Exciting! Oh I am so EXCITED for you Kay!! I LOVE your Medallion Flowers. Congratulations on designing your own products. So happy for you!!! Your creations are STUNNING!! Oh Kay, these are absolutely darling! I love working with dies and am so excited for you and your new line. The colors you used on your cards are fabulous as always!! I was worried about you, but thanks for coming back! As usual these three projects are BREATHTAKING!!!!! Hi Kay!!! 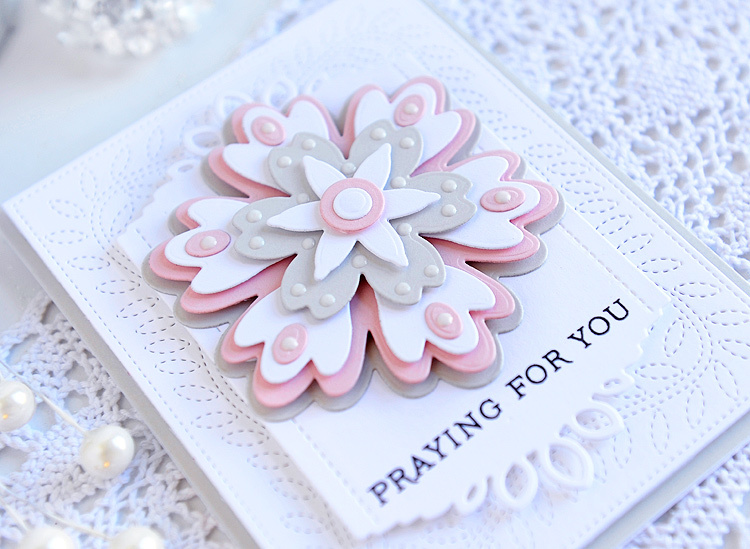 Oh how I love the new dies you designed and cards you created!! I also love how nicely they fit on the quilted die!!!! So exciting and a be congratulations to you my friend! These are amazing, my friend! You are so talented! Beautiful! Just soooo beautiful! Love the dies!!! Congrats Kay! Beautiful die designs and designing! 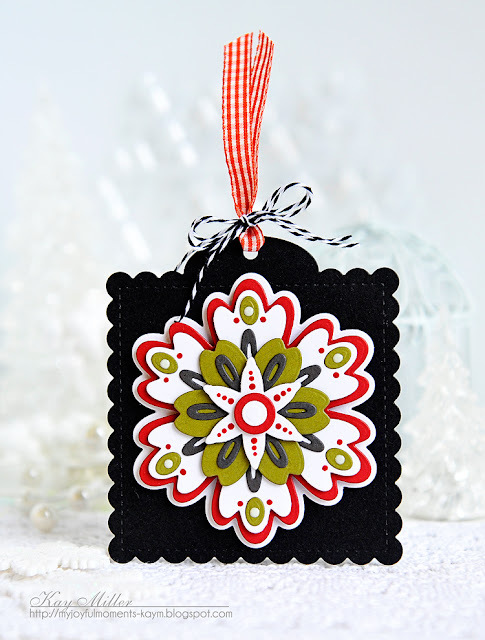 So fun that you're using your ornaments as inspiration for dies too! AWESOME! These are gorgeous, Kay. Can't wait to order these dies! Gorgeous!! 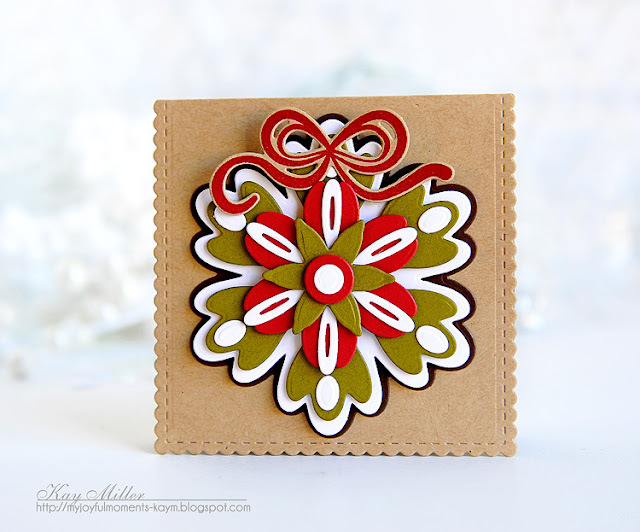 I love your medallions and your cards/tags! Congratulations on this new adventure Kay, I'm SO HAPPY for you!! These are beautiful cards. Love the depth and colors!! For years I've admired your exquisite clay ornaments. I have several that I cherish!! This is such a wonderful way to share and encourage others to let their creativity shine.